The Irish Holiday, St. Patrick’s Day is famous for its vibrant green shamrocks, goofy leprechauns, and Irish inspired beverages. Its bold green letters are displayed on every store window and pasted across website advertisements. It may feel like, at times, that St. Patrick’s Day’s primary existence is the epitome of commercial marketing. Its its annual occurrence only for businesses that are aiming to boost their profits when in reality it contains a remarkable backstory. Dating back to the 4th century, an esteemed Christian influencer in Ireland, Saint Patrick was a real man who, made this holiday possible. Enslaved at the age of 16 by a high priest of Ireland, Patrick first began experimenting in Christian teachings and values and praying everyday. According to the American University of Health Sciences, Patrick received a vision persuading him to flee his master and return home. Soon after he became priest and traveled around Europe until he returned and settled in Ireland. Being born as Maewyn Succat (meaning “war-like”) his name was changed subsequent to becoming an ordained bishop because Pope Celestine I believed that Patricius (Patrick) was more suitable. As a bishop, Saint Patrick is credited for spreading Catholic culture thought Ireland. Interesting enough, the well known symbol, the shamrock, was introduced when St. Patrick described the Holy Trinity (Each leaf being one branch of the trinity). St. Patrick’s influence is recognized throughout Europe, North America, and many East Asian countries. Since his passing on March 17, St. Patrick’s Day is celebrated annually on that day. New York City’s annual St. Patrick’s Day Parade is one of the most significant traditions of the mass Irish immigration to America, showing their prominence and influence in the United States. The great potato famine of the mid 1840s significantly decreased the Irish population, both from fatalities and and emigration. Hundreds of thousands of Irish Immigration flooded into Ellis Island in the decades that followed, bringing their religious holiday with them. 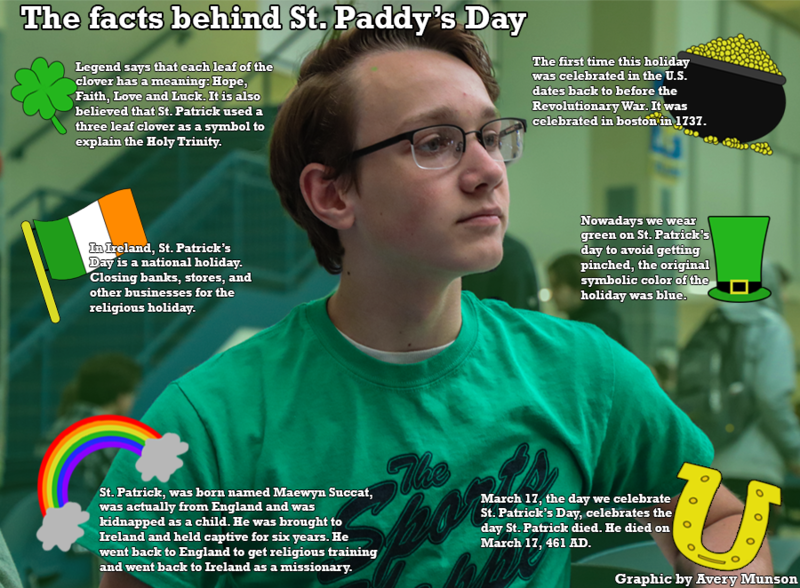 Over the decades St. Patrick’s Day is celebrated as less of a religious celebration and more of a joyful time for feasting, drinking, and wearing excessive amounts of green clothing. But for Irish Catholics, Saint Patrick’s impression still remains strong in their culture.